The on-time annotation will automatically perform an action when a viewer reaches a point in the video without the need for a click from the viewer. Add an on-time annotation by clicking the stopwatch icon. 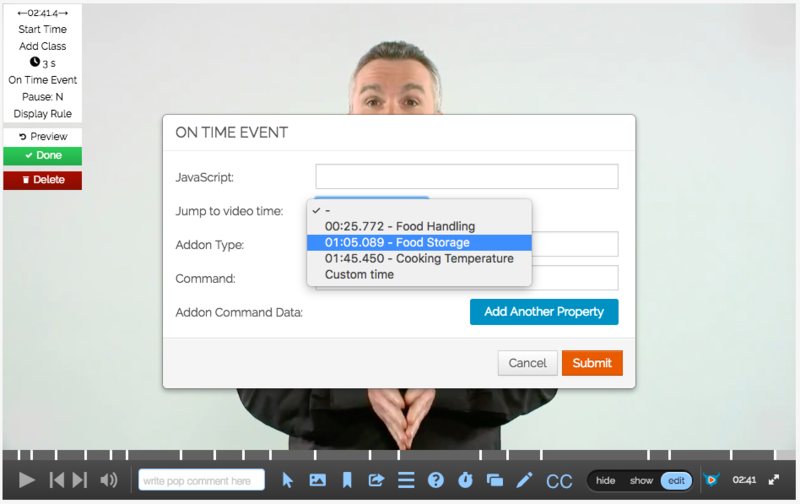 In the "Jump to video time" field, select the chapter you'd like to jump to, or enter a Custom time. Here are details on advanced uses of the On-Time annotation (like Addon Type and Command. Note: By design, the on-time annotation does not perform its intended functionality while in edit mode. This is to avoid disrupting the editing flow. To test, click "show" to switch to view mode.